Laura Perry, author of Ariadne's Thread, a book on Ancient Minoan rites, and also the creator of the Minoan Tarot, sent me this photo of the desk she sat at when she painted the cards for her deck. 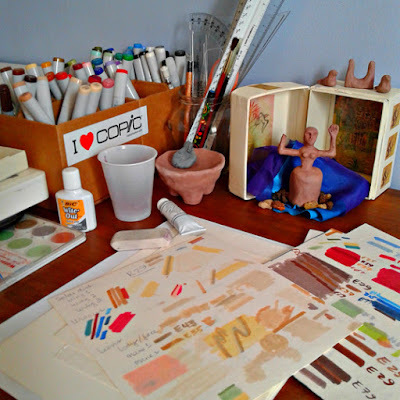 She said: "This is a photo I took of my art work area where I created the images for the Minoan Tarot, among other things. I made the Minoan Tarot deck as a companion tool to Ariadne's Thread, my book about modern Minoan Paganism. You can see a little portable Minoan shrine in my work area, with a tiny terracotta goddess who watches over me as I draw and paint. The shrine is a little box that I painted and decorated. All the pieces store away in it so I can take it with me when I travel, but most of the time it sits right here on my art table." The The Minoan Tarot isn't officially released until January 2017, but you see it on Amazon. On each Pagan Eye post, I show an image that I find interesting, with a few words about it. The picture can be a seasonal scene, a pagan site, an event, or a scan of something you have created or drawn. If you want to send me a photo for a Pagan Eye post, please email it to badwitch1234@gmail.com Let me know what the picture shows and whether you want your name mentioned or not. For copyright reasons, photos must be ones you have taken yourself and you must confirm that you are submitting it for A Bad Witch's Blog.